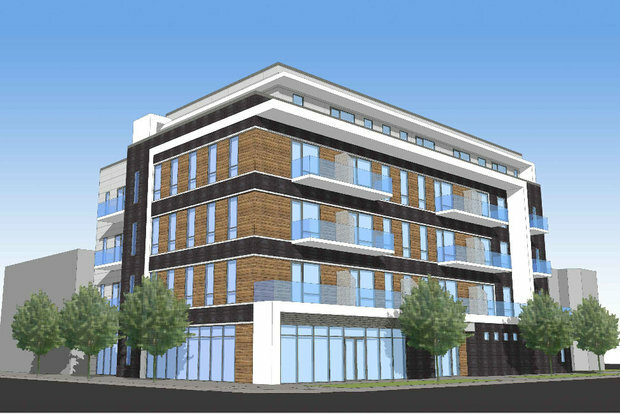 A rendering of the proposed transit-oriented development at 4618-20 N. Western Ave.
LINCOLN SQUARE — A proposed transit-oriented development on Western Avenue, in the footprint of an existing used car lot, has received the support of Ald. Ameya Pawar (47th) over the objections of the neighborhood's civic organization. The five-story, 59-foot-tall building proposed by JAB Real Estate for 4618-20 N. Western Ave. would house 40 studio and one-bedroom apartments, 2,200 square feet of first-floor retail and 10 parking spaces. Because of its proximity to the Western Brown Line station and the Western Avenue bus route, the project qualifies as a transit-oriented development, which cuts developers some slack regarding parking and square footage requirements. After a community meeting in mid-July, the Greater Rockwell Organization — encompassing the area bounded by the Chicago River and Western, Lawrence and Wilson avenues — submitted a letter to Pawar stating its objections to the development. Concerns included the building's size — "totally out of scale with all the other structures in the area" — the lack of parking and the design itself, which organization deemed "uninspired." The organization called for a four-story building, more parking and a design "more traditionally 'Chicago.'" The architecture firm hired for the project is Sullivan, Goulette & Wilson, whose previous work can be viewed online or in person — they designed the mixed-use building at 4800 N. Damen Ave.
"We feel the design of future developments and, for that matter, the developments themselves should be contingent on the approval of the people in the neighborhood affected," the organization concluded. We "are sorry the plan is going through as originally proposed and not modified as we suggested," Kosinski told DNAinfo via email. Pawar acknowledged that feedback from neighbors was split, borne out by comments posted on the 47th Ward's website, with opponents calling the proposal a "monstrosity" and proponents favoring any development that encouraged people "to use their feet" instead of cars. "There are always going to be people upset and I'm OK with that," Pawar said. His decision to support the proposal, which also drew the favor of the Lincoln Square Ravenswood Chamber of Commerce, boiled down to the ward's need to diversify its housing options, he said. Between 2000 and 2011, the ward lost 18 percent of its studio and one-bedroom apartments, he said. "There's a newer mix of folks who want to move into the ward," Pawar said. "You want to make sure young people can move into the community. We need more $800, $900, $1,000 apartments. This fills that need." Where appropriate, Pawar said his overarching plan for the ward is to prioritize density, particularly near transit along Western, Lawrence and Ashland avenues. "That's going to ruffle feathers," he said. "There will be some consternation." He pointed to neighbors' objections to the Lou Malnati's on Lincoln Avenue when plans for the restaurant were first announced. "It's open and people absolutely love it. It looks amazing," Pawar said. Ultimately this is how he believes the new development will be received. Said Pawar, "People will see this wasn't the end of the world."